India has always been the enchanted land, a universe in itself with its unique set of customs, practices and people. Performance magic, whether it is by the juggler, illusionist or the contortionist, has its earliest roots in the subcontinent and much of modern magic owes its origins to the jadoowallah from the East. Fantastical tales of men and beast make their way into historical accounts going back 2,300 years. Native accounts like the Jataka Tales or the Atharva Veda mention the magician and his tricks. During the British rule the Indian performer entertained the empire armed with just a small bag of props in contrast to the big productions of the West. Scores of jugglers, fire walkers, sword-swallowers were sent to England by East India company officials looking to make a killing. They were often not paid any wages and left to fend for themselves. The 20th century saw the organisation of huge expositions or world fairs—human zoos of a kind—where performers from colonised lands were shipped to Europe as living exhibits. Can you tell me about your interest in magic? I am definitely not a magician. I’m more of a historian. Spent a lot of my career working as a journalist and part of that as a foreign correspondent in India. I don’t put my interest in India ahead of my interest in magic, but these two came together beautifully because you know, I’ve been going to India for a very long time, and studied Indian history. A couple of my other books are also based in India. The thing is that the story of magic is alive to so many different aspects of Indian culture and society and history. How do magicians define magic? Is there a difference between, say, what a juggler thinks of his craft versus somebody who’s an illusionist? You should best be asking a magician that question. I mean for me magic is one of those words that is used loosely. You can have a magical experience that’s got nothing to do with magic. In my book I discuss the really simple but all-encompassing definition of ‘The artful performance of impossible effect’. So that brings in the performance aspect of it, and leaves it open-ended enough to include, you know, all sorts of manner of tricks. In an Indian context it’s different. A western magician would not make any pretence to what he or she is doing as being in anyway supernatural whereas those lines between scientific rationalism and supernatural magic—the magic that defies laws of nature—those boundaries are blurred in India, and deliberately so. Would you define snake charming as magic? I thought if you knew how it was done you would. It is very much up to the spectator whether he or she believes that what they’re seeing is magical or just trickery. John Zubrzycki. Photo: Special arrangement . Title photo: A troupe of Indian show people, postcard printed by Gobind Ram and Oodey Ram, Jaipur, c. 1900. Priya Paul Collection. Early in the book you speak of the barah pal, the Brotherhood of Twelve, the ancient collective of strolling players. The brotherhood in a way transcends their own caste and community identities. They can share a cooking hearth, for example. Can you speak more about it? When I asked a group of jugglers in Delhi, it took them a little while to come up with all the different categories of performance. And some of some of those categories aren’t going to be particularly magical either, like puppeteers. Look it’s (the brotherhood) an informal thing and it was something that was relayed to me by several people. I struggled to find literary or historical references. It is something the people are aware of. It’s just the reflection of the fact that magic being a form of popular culture in the way, and nor are these things written down. It’s more tradition that is shared by communities, and understood as such. A western magician would not make any pretence to what he or she is doing as being in anyway supernatural whereas those lines between scientific rationalism and supernatural magic—the magic that defies laws of nature—those boundaries are blurred in India, and deliberately so. The first couple of chapters have many references to how the Vedic period was full of charms and spells, how the Atharva Veda has the fire worshipping Brahmins, etc. How did magic come to the street performer? Were there jugglers even then or was it just the priestly class? There were jugglers even then. I think that the Arthashastra, which is later of course, mentions jugglers and other types of performers that were taxed, and yes, were also used as spies. So that was another indication. Even when you look back at the Jataka Tales, so many of the stories have tricks mentioned in those tales. There are mentions of certain communities that do some sort of necromancy. With all these things it is always going to be an element of actual sleight of hand employed. Temple religious rituals would employ things that the worshipper would not know, would think of as being magical because the priest or the magician or the whatever it is, there’s always going to be an element of performance. You talk about how performers from India, from ancient India in particular, were all over the place. They were in China. They were in ancient Rome, they were in Baghdad but it was not so much of a two-way thing. We didn’t have that many performers from these places here. We had travellers. Oh, yes look that’s a good point. It’s you know somewhere in historical records mention of magicians from other countries coming to India. It’s just that with all these things often, these records are maybe more occupied with higher matters of state, war or conquest. Personally, certainly you’d have to assume that magicians from these other places would have come to India as well because you only have to look at something as simple, as elementary as the ‘cup-ball’ trick. You get the first evidence that was used as a magic trick in Egypt around 2500 BCE and it is now part of the repertoire of every jadoowallah in India plus every Western magician. There’s evidence that it was widely practised in medieval Europe. 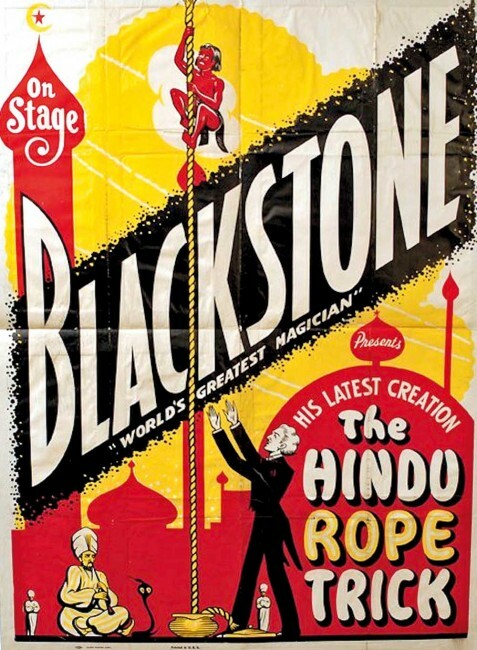 By the 1920s the Rope Trick was on the programme of many of the world’s leading magicians including Harry Blackstone. Photo: Wikimedia Commons. Accounts of travellers to India, and you cite many of them, beginning from Herodotus in 3BCE, have fantastical descriptions of people. ‘Men with canine heads who bark’, ‘the umbrella foot man’, dragons and what not. Why were they so embellished? I think they were embellished because India was this far off the seas land on the edge of the known world. 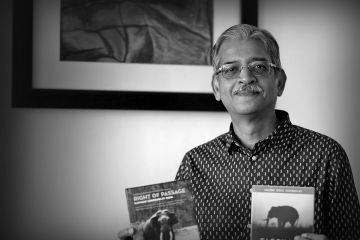 I wanted to bring them in because I wanted to create this notion of India as magical, mystical, mysterious land. That picture of India was something built up over the centuries. Added to it by every traveller that came from different parts of the world. Alexander the Great, Marco Polo. All those people who passed through and added their two cents worth for this magical lore. You speak of a period of tension between the Sufis and sort of Hindu native performers, each trying to prove their magic was better. (Laughs) Uh, you know again, that’s something that I found fascinating. You talk about Gorakhnath of the Nath sampradaya and Kabir, they are from 11th century and 16th century respectively, and the oral tradition that speaks of this magical duel between them. Yeah, these legends have made their way into religious folklore and so on but they were there, you know, in order to prove a point, who’s who, which religion was stronger, so on. You find this also in Buddhist accounts. What was the Sufi approach to magic? It was a way of finding God through magic? Pretty much, yeah. There are examples of Sufi saints using great sleight of hand in order to enhance their own powers to attract more followers. So there’s always that element of actual magic. What was the place of women in the Indian magic tradition? A troupe of magicians comprises men and women and, of course, children as well. There were different roles that the women tended to do more. The physical act, like the balancing act. Tightrope walking. Walking on the edges of swords. I guess it’s mirrored in Western performance magic as well that that it’s mainly a male domain even now. There aren’t that many female magicians around, even in India as well. Maneka Sorcar (the granddaughter of P. C. Sorcar) though, is a performer in her own right. By and large women were often assistants; sawn in half, made to disappear or levitate. I guess often because, you know, they were smaller and more agile for those acts. Most performers belong to the various nomadic, marginalised communities. Some of them had thievery, kidnapping as their professions, and the Criminal Tribes Act, 1908 made them all outlaws and killed a nomadic way of life. What impact did it have on that craft per se? It’s hard to quantify what impact it had on the craft. They were definitely sizable in number so, even if they were made to give up their nomadic way of life they still needed to find a way of making ends meet, and it’s quite likely a lot of them would have migrated to the bigger cities and kept on performing there. What do you think of the British attitude towards these communities? As far as the British attitude, it was, you know, coloured by the whole war against the thugs. There’s quite a bit of academic debate as to whether this cult of the thugs was created or whether there was this group. The British suspected them because they were nomadic, and maybe, more difficult to control. They wanted to do everything in their power to, I guess, on one hand protect innocent people from the circle of crime. There was also the whole civilising mission. Right after missionaries started arrived in large numbers in the early 19th century. 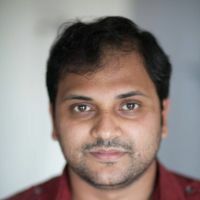 One interesting person you mention is Krishna Raghunathji, the editor of Bombay Government Gazette. His “Bombay Beggars and Criers (1892)” is a rare matter-of-fact account of street communities. Can you tell us a little more about him and his writing? I wish I could. I looked everywhere I could for more information about him. He wrote quite an academic work on the devdasis of Bombay who came from Goa. He was obviously interested in beliefs and unusual customs and practices that were common in Bombay at the time. That’s a very interesting individual. 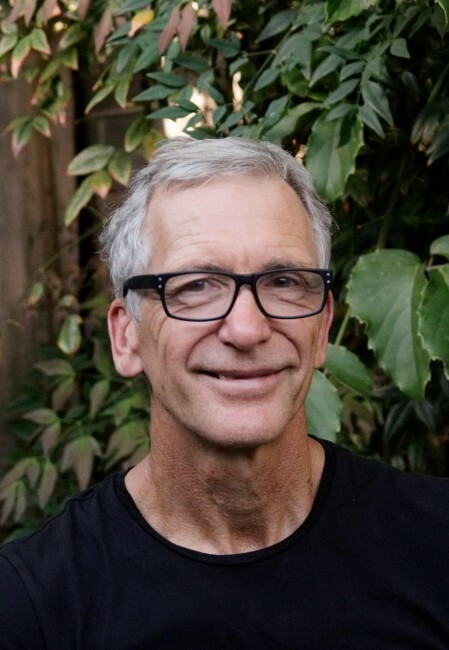 I wish we could find out a lot more about him because his Beggars and Criers is really quite a unique piece of anthropological reportage for the time. What do you think of the expositions and world fairs? They were sort of human zoos for the entertainment of colonial masters. What was the reception in the UK or in France? The importance of these expositions can’t be understated. More than 50 million people visited the Paris Exposition in 1900 and many of them would have seen performances by a troupe of magicians recruited by none other than Motilal Nehru. There were international exhibitions every year in some part of the world in the late nineteenth and early twentieth centuries and India and its magicians featured in most of them. There was a huge demand for exotic show people and animals from places like India. The Hagenbecks, originally from Germany, dominated the trade in people and animals using Ceylon as their main base. Most of the Indians were Tamils who were recruited in South India then sent to Ceylon to avoid emigration laws. Some had done so many trips to Europe they had picked up languages such as German. There was an exploitative side to the trade of course with hundreds of Indian entertainers being abandoned on the streets of Britain and Europe unable to return home. The success of the Indian performers sparked a trend in Western magicians, what you call ‘cultural cross-dressing’, dressing as fakirs, colouring the faces, even copying the acts of Indian performers. What was the state of Western magic when the Indians first started show their wares in Europe? In every sort of performance genre, originality matters. When Indians first went to England, magic was in a bit of a transition stage from the fairground, where it was catering more to the lower classes and doing rudimentary stuff. By the early 19th century magic was increasingly moving to theatrical venues. The middle class had arrived by the mid 19th century. Magic moving to theatrical venues—is it a western innovation? Very much. Yeah, it didn’t happen in India where you had a theatrical network once the railways started expanding around. And then later you had the Indian magicians in a more English-speaking educated mould. That followed a movement to India of prominent Western magicians of the time, who were all keen to pick up tricks here and at the same time spared no opportunity to show contempt for the local performers. Yeah, that’s right. There are certain rules of magic, one of which is you don’t reveal the tricks of others. Yet these performers broke this rule here, exposing the acts of Indian performers. They wouldn’t have done that to fellow western magicians. 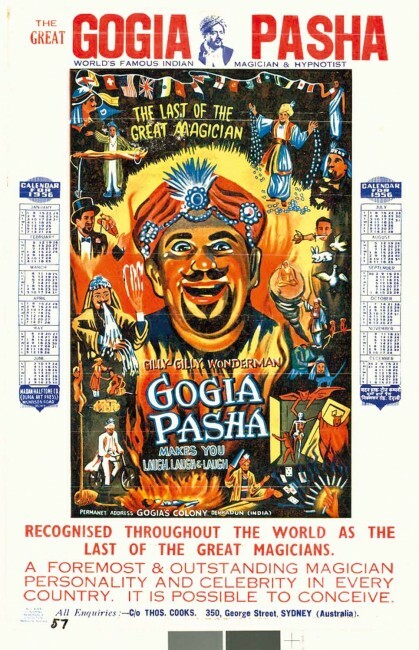 Publicity calendar for the 1956 Australian tour of GogiaPasha, ‘the last of the great magicians.’ Alma Collection, State Library of Victoria. In a lot of these accounts by western magicians, as you have mentioned in the book, descriptions of acts and shows have turned out to be lies. Look, they wanted the best way of proving their superiority, and revealing the tricks of native magicians—a lot of that was being done in the 20th century. You know let’s go to India and travel around and come back and tell your audience that you performed in a Maharaja’s palace. You picked up a secret magic trick from some sadhu sitting on the banks of the Ganges and pretend to present that to an audience. It was very potent, a proven formula that the audiences loved. The Great Indian Rope Trick. Do you think it exists? The Rope Trick was the most controversial feat of magic in the late nineteenth and early twentieth centuries. It was based on myths that can be traced back to the Jataka Tales of the 6th century BCE but was given a new lease of life when the Chicago Tribune, to boost circulation, published a piece of ‘fake news’ in 1890, claiming it was the result of hypnosis. This set off a storm of so-called eyewitness accounts, but the trick was never proven and as a feat of magic can only be done with sophisticated props. So the trick of legend is not real though some magicians have come close to replicating it. But making a rope rise into the air is one thing, making an assistant disappear is another. Nice story but no fact. Modern Western magic, how much of the Indian or the Eastern influence does it have? Very much. I don’t mention it in the book but some magician themselves have gone so far as to say that all magic originally came from the Orient. Not just India and China. That the only contribution of Western magic was a card trick. Stickers cards, although they originated in China, in the 8th century. They were incorporated into magic in the late 18th century. Because magic is such a transnational genre, to say that it all originated from the Orient is probably quite accurate; and a lot of that in India because with many magical traditions and the expertise of its performers would have had a disproportionate impact on the magic of China or Japan. Would it be accurate to say illusionists like David Copperfield owe a lot to arts which came from here. Yeah. They wouldn’t necessarily acknowledge it. But yeah, definitely. You devote a chapter to P. C. Sorcar, self-proclaimed “The world’s greatest magician (TW’sGM)”. What do you make of him? His story is something that really has never been told properly. Most of the accounts we have of him are very hagiographic. He was, of course, such a self-promoter. Someone who didn’t brook any competition or criticism. He was successful everywhere. Specially after the BBC show where he sawed a girl in half. None of us call ourselves the world’s greatest something, that’s the title bestowed by others. After the BBC, he really never looked back. He was very successful and he worked very hard. What his story brings out is the divide between East and West. There were a lot of magicians from the East or India who were looked down upon and he changed that perception. There was also the competitive nature of magic, and his run-in with Kalanag (the famous German magician) who accused him of stealing his tricks. One of his defence points was that everybody is stealing everybody else’s tricks. That’s just the nature of magic. How great is his influence on Indian magic? Most Indian performers are still doing some version of Sorcar’s ‘Indrajaal’. Yes, it’s there. I mean the number of people who mimicked him—and I am talking of just during his lifetime—was huge. The number of Bengali magicians calling themselves the greatest this or the greatest that, and in their poster and costumes really try to replicate as much as of Sorcar. What made him so successful, because other magicians didn’t think too much of his abilities as a magician. He was a great publicity machine, and his stagecraft was great. Extravagant stage, numerous costume changes, music, dance, incredible props, it’s just the atmosphere that he was able to create on stage was quite unique, quite extraordinary. There was a East/West divide, between magicians based around Bombay and the Calcutta group. Even now in Calcutta you will find magicians who admire his skills as a magician. He was a very good illusionist because he utilised all these props and stage techniques to create his show. Take all that away then there were magicians who believed he was quite limited. But then you can’t ignore the fact that he did bring Indian magic to the world stage. I don’t think we’ve had a performer after him to do that. No. And probably never will either. 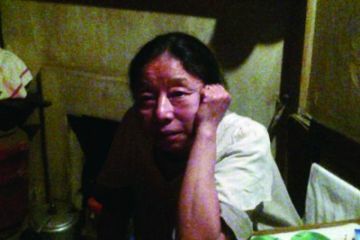 A conversation with Nagaland poet Nini Lungalang. 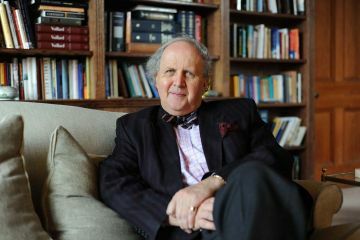 Alexander McCall Smith chats about philosophical detectives, colonialism, and children who stay the same age for eight years.